The first Avid Baker's Challenge recipe of the year is Eve Lieb's Processor Challah from Flo Braker's book, Baking for all Occasions. I happen to love Challah, especially paired with something savory like cheese or paté. (I have this crazy sweet and savory thing going on). 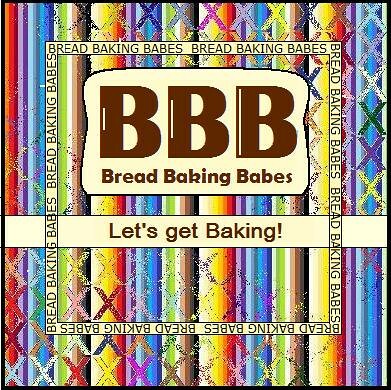 The recipe –in this baking group we encourage you to buy the book so we never give the recipes - calls for using a food processor to knead the dough… raised my eyebrows a little because it’s a sort of no-no thing in kneading bread dough. Often the processor runs your dough too hot due to the friction and the lovely yeasty beasties will likely suffer from it. So yes I was a bit worried. Turns out I didn’t need to, the dough came together very nicely but I took care to stop the machine quite early on because the ball of dough worked my knife up . By then I had a rough ball of dough that only needed 5 minutes of hands-on kneading to become supple and firm, ready for it’s first proof. My kitchen was a bit chilly so I let it be for quite a while and in the end used my microwave on 40C to speed things up. Bowl covered with a showercap, no problem. Great dough to roll out in ropes, and easy to braid. By the time the dough was ready to braid I had only 10 minutes left to get to an appointment so I didn’t do any intricate braiding, just made two three strand braids and connected them to form a wreath. (Braiding with long ropes works best when you lay the ropes out cross wise connected in the middle and start braiding from that middle and you’ll end up with both ends nicely tapered). Brushed with some of the reserved egg (added a tiny bit of salt) and sprinkled with sesame seeds, lots of them! I love the combination of crunchy sesame seeds and sweet challah! A wonderful recipe that works and presents a great loaf of bread and a tight golden crumb . See what the other ABC bakers thought of this month's recipe. You can find the ABC blog roll HERE. How perfect round this braided wreath is. Great way to start the new year! Oh my goodness, it's perfectly round! Love the dark golden color on yours. And the interior looks beautifully soft and airy. I'm happy you enjoyed ABC's first recipe of the year. I'm trying to figure out which Challah recipe you liked better. So, in comparison to your other Challah bread from a couple weeks ago, how did you like this one? Btw, don't forget to add a link to your post on the ABC blog. I liked this one better, the flavour of the crumb was softer. The last one I baked was mmmwahokay.. I guess I messed up with that one somewhere because I made it before and I scribbled in the book that it was great. You know, before we came to the UK I used to use the food processor to knead all of our dough. I'd let it go for sometimes as much as 1/2 of an hour, with a very wet dough. At that point, I could add as much as 2 cups of fiber (oat or wheat bran) plus 2 cups of flax-seeds, and that's for 4 loaves of bread. The extra kneading developed the gluten sufficiently to allow the bread to hold that much extra stuff. So - never fear the food processor! @David: really? Wow! Mmmm possibilities! Note to self: might be a good idea to check the 18yr old manual to see how much dough it can hold because this was already a tight squeeze. For a great new year this recipe was a huge success to start with!! Loved the Challah too! Your wreath is perfect!! I will make a note to myself to try your method of making two loaves and then connecting them. Thanks for the tip! Your bread looks delicious and I can imagine how great it tastes! Since you're so much into bread (and are really good at it!!) I just had to share my 100% whole wheat bread success with you. It's on my blog, check it out :o) Fijn weekend!! I am Foley (Foleybread)you did comment on my challah bread, I like the way you bake, and I really looking forward to reading your comment on my future baking, I did new bread (Italian) and another one will come soon (wheat loaf), by the way I like the sesame seeds on your challah, it is good idea that will make it taste very good.